A handy little device to have in the kitchen, the 3.5-cup KitchenAid KFC3511WH food processor saves you time performing simple cooking tasks: chopping, mixing, and pureeing veggies, nuts, and whatever else. The bowl’s small size makes it ideal for small families who like some assistance preparing dips, sauces, and dressings with little clean-up effort. The base is sturdy and simple to wipe down; the bowl and blade simply go in the dishwasher. If there’s one factor we were not satisfied with, it’s the potential for some spills when the mixture is really smooth. 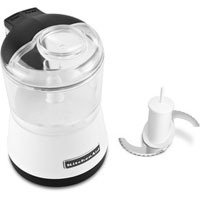 However, for the function it provides and the low cost of $39.99, this food processor has a great value for small households.